As seen in the launch images before testing began, Sauber installed the vertical sidepod airflow conditioner and horizontal vane for the Bahrain test. It is interesting to note the angle at which the conditioner lies relative to the floor – it is very aggressive. Most of its profile is aimed at the tyre wake that is projected off of the front tyre at speed, diverging its path away from the critical undercut of the sidepod. 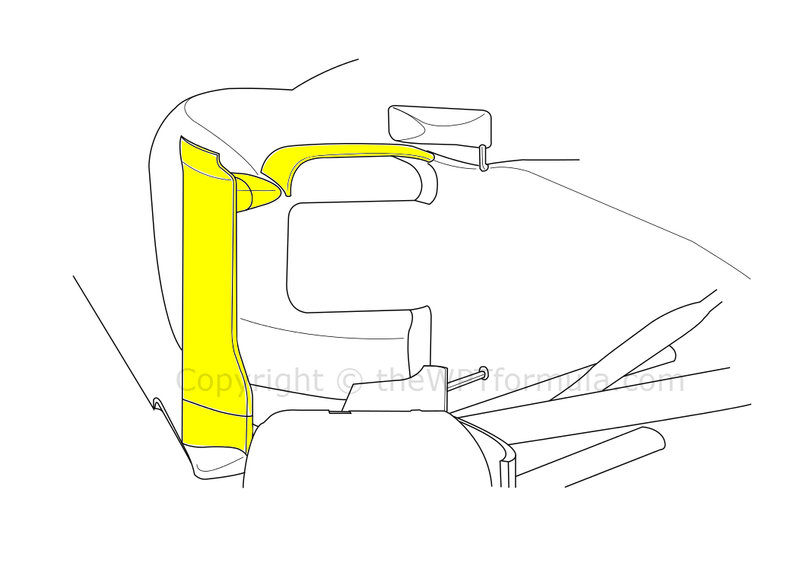 The undercut feeds airflow from the bargeboard towards the central section of the diffuser so it is important for this air to remain undisturbed as it makes its way around the car. The aggressive angle of the conditioner should mop up most of the turbulence the moving tyre creates. The lower segment of the conditioner is cut further inwards. The angle at which this is set lines up with the path of which the vortice produced at the Y250 region of the front wing travles along. It deflects the large vortice around the sidepod and towards the rear of the car where it can either seal off the floor along its side or near the rear tyre. This allows teams to run a higher rake angle and increase rear downforce as a result. The horizontal blade acts as a downwashing aid over the top of the sidepod, sending airflow towards the top of the diffuser. This creates a higher pressure delta between the top and bottom sides and, interacting with the gurney tab along the top of the diffuser, extracts more downforce from the rear of the car as a result. A new front wing was also successfully debuted at the second test session. 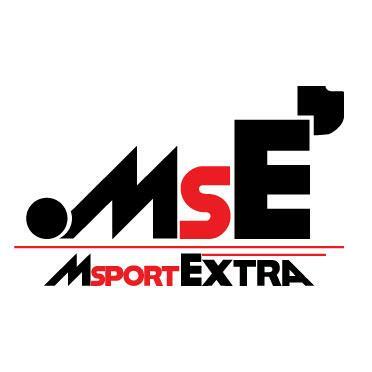 Its main profile has been completed redesigned compared to its predecessor and the endplate also received some small modifications. The main plane is split into 5 segments at along the outer portion of the wing and the upper flap divides into two, creating a 7 element design. More elements allows for more consistent downforce production across a range of speeds but has an overall reduction of peak downforce (less elements has the opposing effects). More importantly, the increased number of elements helps airflow expand around the front tyre and this works in conjunction with the modified endplates. The endplates now feature a small undercut at their trailing edge and an elongated vertical slot. I would imagine that the undercut allows airflow travelling along the base of the wing’s profile to “escape” earlier, taking a lower angle around the front tyre as a result (just an idea, I have no proof of this). The slot allows airflow to transfer from the inside of the wing to around the endplate, which might occur at a certain range of speeds to give a desired outwash effect around the front tyre. The upper flap has also received some treatment, although the cascade elements remain the same. Sauber also added their Y100 winglet above the exhaust outlet. Craig Scarborough posted a tweet of the C33 during Jerez without the winglet and the upwash effect (shown by the exhaust’s heat haze) at the rear of the car was already evident. The winglet will enhance this further in a bid to produce more rear downforce. It is now common practice for teams to exploit the rear brake ducts as aerodynamic devices. Sauber had a very basic rear brake duct configuration in Jerez but arrived in Bahrain with a multiple tiered design aimed at generating downforce directly to the tyre and creating a further upwash effect at the rear of the car. The stacked elements were combined with their internal hub/drum thermal system that we started to see during 2013. Instead of venting air out of the outer face of the wheel, air is circulated inside the hub before exiting backwards via a duct mounted to the inside fave of the wheel. This reduces turbulence and increases aerodynamic efficiency. 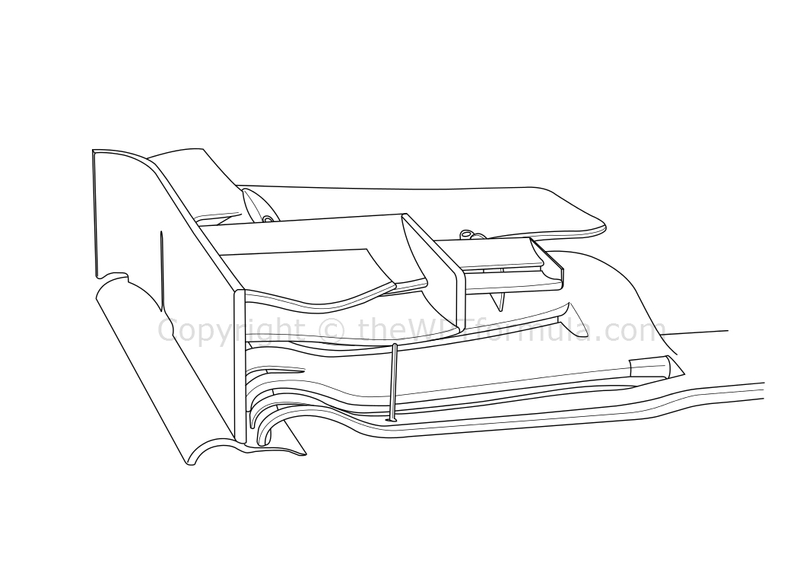 A revised diffuser Gurney tab and rear wing were also present, as seen in the link above (credit to @Pjdona for the link). The 22nd car from Enstone made its public debut this week and it had some very intriguing features that make it stand out from the rest. Although I might not have a full analysis of it for now, I wrote an analysis of the render we saw in January when it was released. Since then, however, more detail has obviously been seen. Along with the twin ‘tusk’ nose solution which has now been discussed fully, Lotus have some small devices that appear to be well thought through. Above we can see a small panel that attaches to the spine of the engine cover, featuring an fairly large outlet (the panel also features inlets but these were hidden in the image beneath the cooling fan arrangement as the car was stationary in the pits). The outlet is directly above the turbo unit and provides a direct exhaust for the extremely high temperatures built up in the turbo to escape. Whether this has a positive impact on the rear wing immediately behind remains unknown. The panel can be interchanged, possibly for ones with a larger inlet or outlet as opposed to an ordinary engine cover. This design addresses one of the multiple issues with the Renault power unit, this problem being that too much heat is built up in the turbo. With Lotus running a fairly solid final few days in Bahrain, it appears that they may have stolen a march on closest Renault-powered rival, Red Bull. 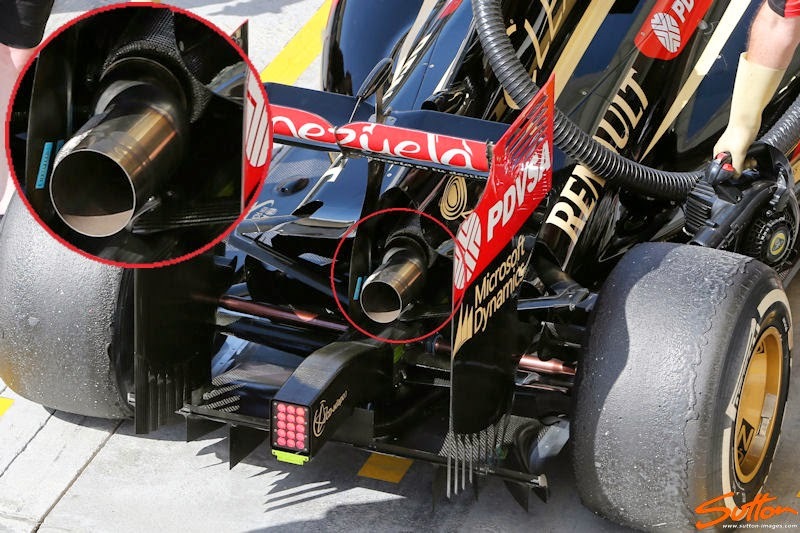 Lotus are also the only team to have an offset exhaust exit. The regulations stipulate that the last portion of the exhaust can exit up to 100mm either side of the car’s centreline. 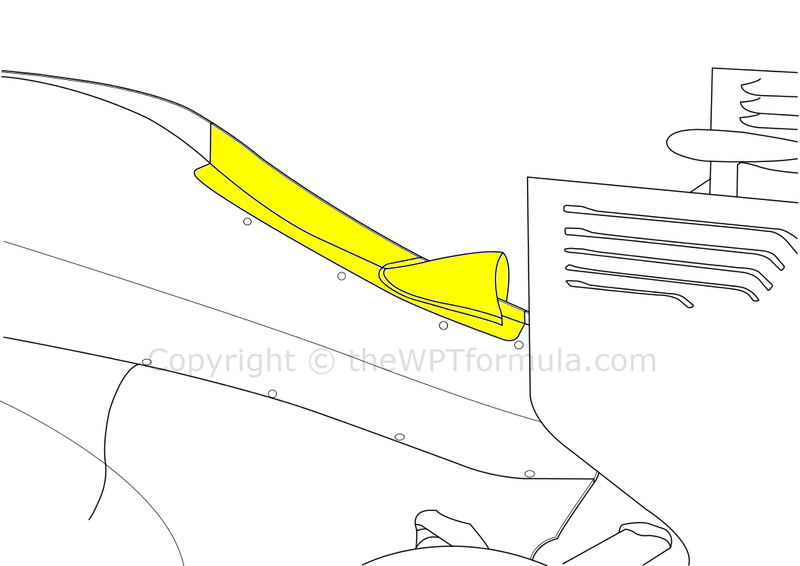 One sole rear wing pylon attaches to the middle of the rear wing but curves around the exhaust at its base. 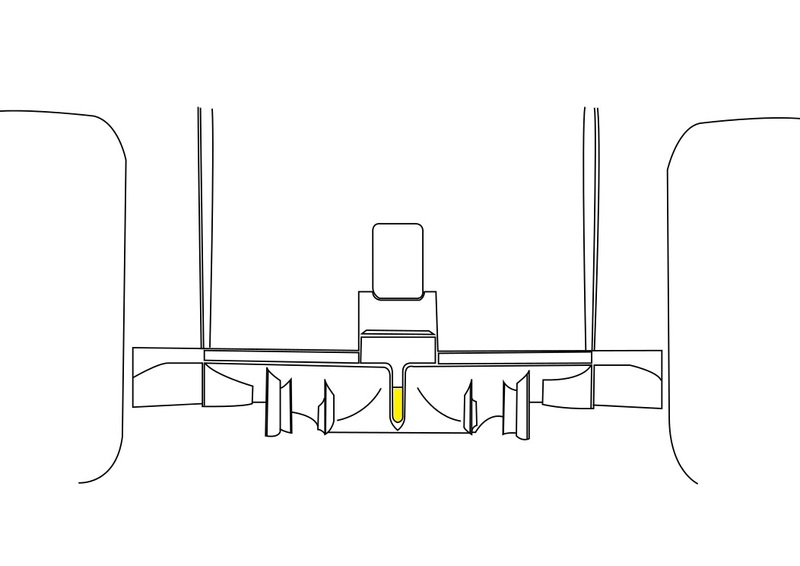 This improves the efficiency of the rear wing (only one pylon instead of two; pylons disrupt the airflow passing beneath the wing where they are attached) and is also a much lighter solution. This does leave us the question of how exactly they will mount the Y100 winglet and whether they will be able to maximise the exhaust’s potential despite its asymmetric position. Taking a leaf out of Red Bull’s book, Mercedes tested an alternative rear bodywork package throughout the four days of testing. The W05’s standard package features larger openings in the sidepods before the suspension elements stem from the gearbox casing. 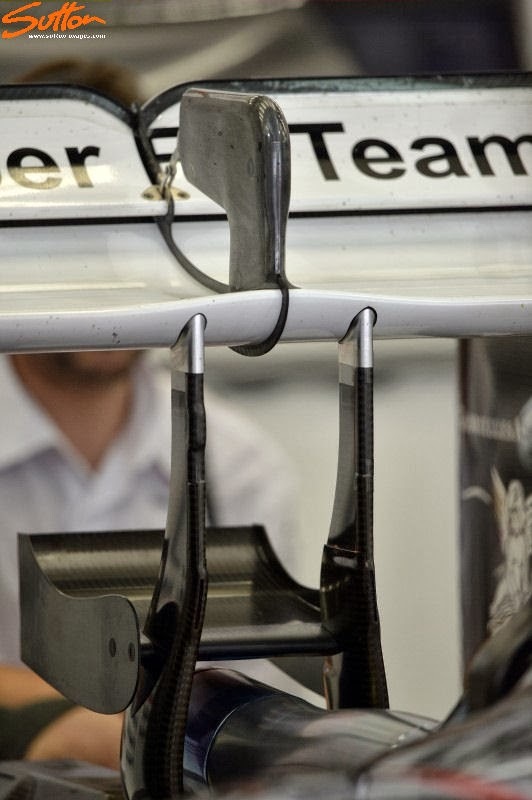 However Mercedes have also been running much smaller sidepod openings coupled with a larger outlet around the exhaust. This slims down the sidepods significantly which allows more airflow to reach the top and central areas of the diffuser as a result. Given that the team did not experience any inherent overheating problems they may well develop this solution further before next week’s final test. Following on from my launch analysis of the W05, there has been a recent discovery for the peculiar ‘u’ shaped central section of the diffuser. Since 2010 the FIA have been limiting the proportions of the opening in the middle of the diffuser that allows access to the starter motor hole (incredibly, in this day and age, F1 cars still need to be started externally…). This hole has been used for an aerodynamic advantage in previous years by drawing air from the base of the sidepods towards the middle of the diffuser. For 2014, the FIA have stated that the hole may either have a hinged flap or that it is not visible from below the car. Rather than get rid of the hole, Mercedes have brought forward the central section of the diffuser so that an opening can be cut that is not visible from beneath the car – it’s vertical. This allows for the same aerodynamic effect as previously exploited and is totally legal. At the moment, every other team is using a hinged flap arrangement.